It’s been raining the better part of the last several days in eastern Ohio save for a brief and sweltering hot reprieve for a few hours Tuesday night. 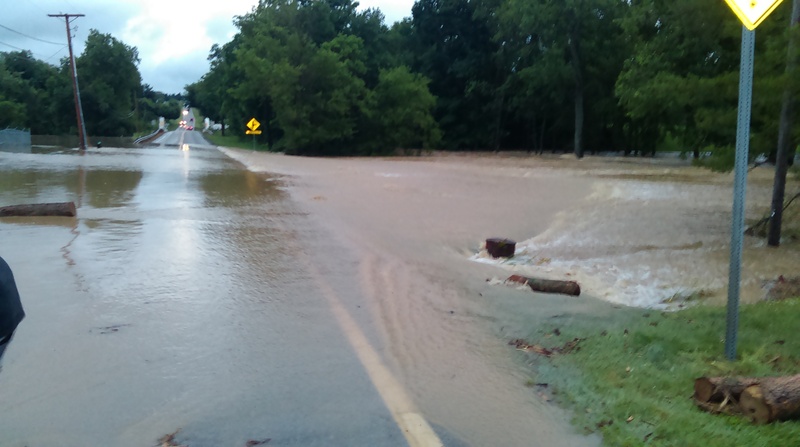 We woke to a flooded road early Tuesday morning – 5:30ish – and an only slightly better Wednesday where it continued to rain but not as hard. We live in a small village east of Johnstown and Southeast of Mt. Vernon. 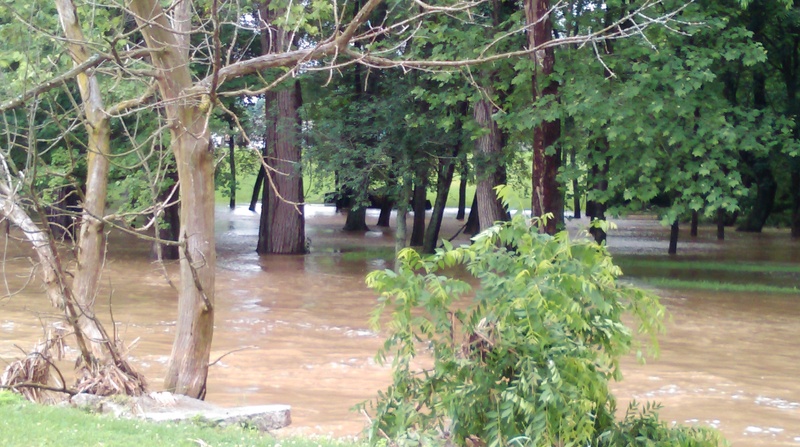 The Wakatomica Creek flows nearby, along the edge of our neighbor’s property, two doors up. The creek actually crosses the state route headed south a good quarter mile up the road then turns west for most of that distance only turning south again as it nears my neighbors land. At it’s usual levels the ‘Wak’ is six inches to a foot deep…a slow moving, babbling brook that you can always catch frogs and tadpoles in and, occasionally a small fish or two. The banks on my neighbor’s property run a couple of feet high to more than eight feet near the back. On Tuesday, after 3.5 inches of overnight rain that overwhelmed it’s feeder creeks, it overflowed all of that and then some. The scary thing was, most of the water crossing the road that day came from the upstream part a 1/4 mile away! The banks upstream are not as high and the water flooded a farm field. Where it crossed the road, the water was over a 4-5 foot embankment and further downstream along the back side of my neighbor’s property, it was over an 8 foot bank! 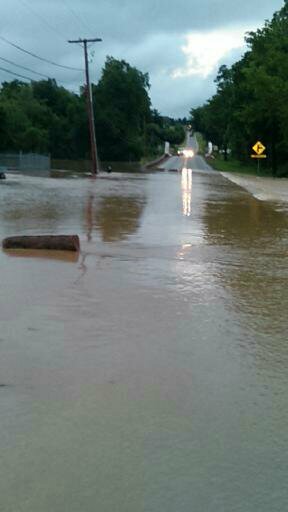 This is the state route that runs past my home. The road was clear until a about 100 yards past me and then it was impassible for all but the bravest of souls in lifted trucks. The water was running quite fast. The headlights are just to my side (as the photographer) of a bridge – notice the white pilings to either side. 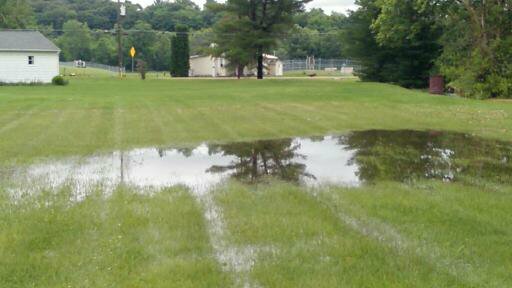 That’s where the creek flows under the road from north to south! It turns west right after that. Using the telephone pole in the photo as a guide and looking across the photo, you can see where the water was actually rushing the fastest into the lower portion of the creek. The log nearest to my lens was actually carried about a 1/8th mile from a tree that was cut. It’s hung up near the edge of the road bed. This house is across the road and up a few from me. It sits right next to the field the upper stream flooded. Interestingly, it was lifted and raised on a new foundation two more cinder blocks high after a 1979 flood of the area. 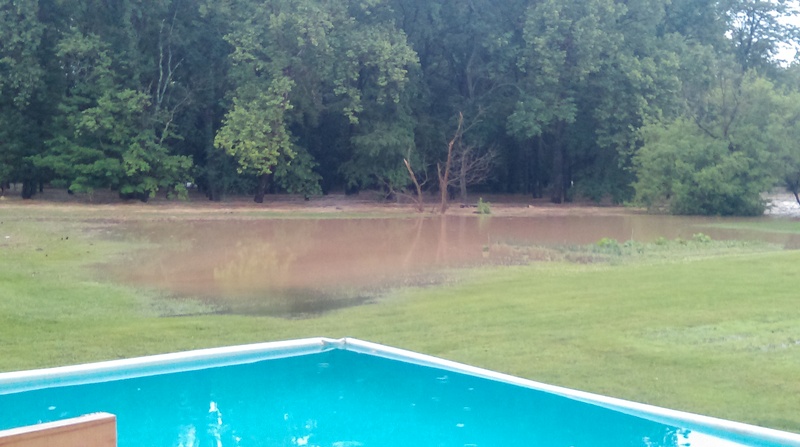 At the time of this photo on 6-16-2015, the water was still surrounding the house and obscuring the foundation but was a little less than mid-thigh deep. It had been nearly level with the front porch. 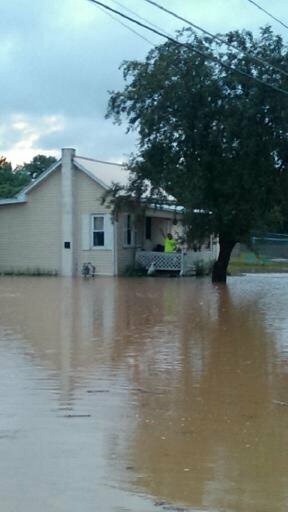 My stranded neighbor is seen waving from her porch. She’s okay and no water got into her home but it was a very close call for her. A view of a little of the debris that was being carried across the road. Driver’s still tried to come through thinking there was no current. Dumb drivers! Never cross water like this in the road. There barefoot girl in the photo is my niece. She wasn’t thinking and we made her move. This is shot from my back deck on Tuesday morning, about 6:40 AM. The creek is usually almost 200 yards away across the yards of two neighbors. Not so Tuesday. Oh, and it’s banked at eight feet or so where it’s overflowing here (it normally runs about a foot deep in this area). Finally, these pictures all show a still bloated stream – and especially the low land across from it. They were shot on Wednesday from near the bank in my neighbors yard. Looking north at a still bloated flow. It’s still over the high bank as the next few photos will show. Looking straight across at the low lying land. A full size farm tractor is in the background at the edge of the water. It was engulfed in water on Tuesday. A close up shot of the view just slightly south of where the tractor is stranded. 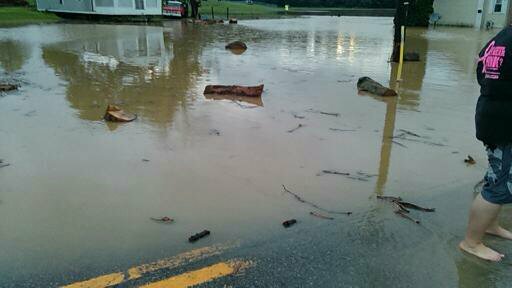 This entry was posted in Musings, Uncategorized and tagged 2015, Flood, flooding, June, Ohio, photo, photos, Pictures, rain, torrential rain. Bookmark the permalink.